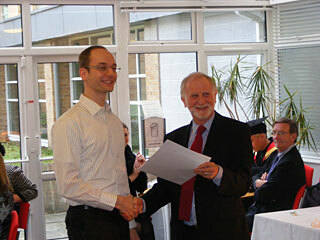 The Kingsman Prize for 2010 has been awarded to Management Science PhD graduate Arne Strauss. 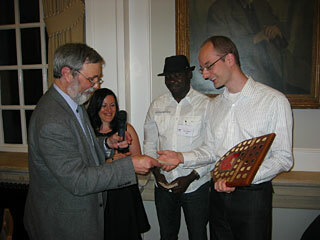 The prize was established in memory of the long-standing scholar of Management Science, Professor Brian Kingsman. Arne has completed his PhD in three years after obtaining a MSc in Mathematics at Virgina Tech and a Diploma in Mathematics from the University of Trier in Germany. His supervisor, Dr Joern Meissner, identifies him as the most capable PhD student he has worked with so far. Arne’s thesis advances state-of-the-art models in revenue management (RM), an application area concerned with maximising expected revenue from the sale of products that use perishable resources. For example, products might refer to flight tickets and resources to flight legs in an airline network. RM approaches also arise in many other practical industries such as train, hotel, car rental, etc. For any application, a decision maker needs to formulate a decision rule (policy) that determines which products to offer at any point in time throughout the selling horizon. In recent years, increasing effort has been devoted to incorporating the choice behaviour of customers into network RM since demand for a particular product is often observed to be dependent on the offered alternatives. In this context, Arne’s thesis addresses important optimization questions that lead to improved policies by taking the dependence of the offered products into account. His research is of great practical importance and has already attracted the interest of revenue management professionals, leading to a project with Lufthansa Systems. At the recent OR 52 Conference at the Royal Holloway University of London, the Operational Research Society prize “for the most distinguished body of research leading to the award of a doctorate in the field of OR in the UK” for 2009 was awarded to LUMS Management Science PhD Graduate Arne Strauss, who has since been appointed at LUMS under a PhD Plus Fellowship and will soon start a position as Research Associate under the LANCS Initiative. Arne was supervised by Joern Meissner. In his dissertation, Arne pursues various research objectives within revenue management of a network of resources where customers choose between available product alternatives. Accounting for customer choice behaviour is necessary to accurately represent demand in markets where customers choose between several product alternatives, as it is particular the case if fare products have been simplified so that fare restrictions cannot properly segment customers any more. Such situations occur in many industries that use revenue management, for example airlines, trains, car rentals or hotels. It is therefore important to incorporate customer choice into the optimisation models, however, it also causes the resulting optimisation problems to be highly complex and difficult to solve. Arne develops in his dissertation approximate methods to tackle such problems.